Overview. 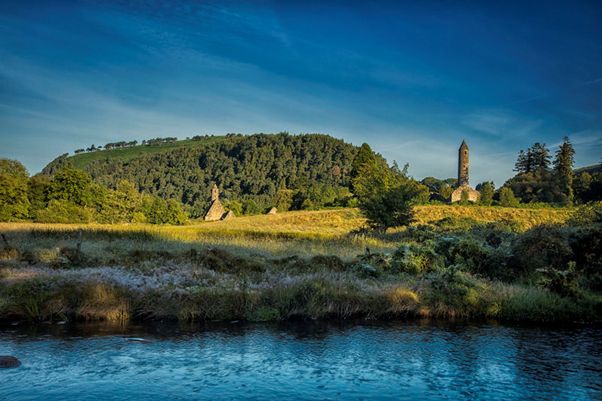 Pilgrim trail from Hollywood to Glendalough, which reputedly follows the journey of St Kevin to found a monastic settlement in the heart of the Wicklow Mountains. Well-marked track rises gently to the sweeping viewpoint of the Wicklow Gap before descending easily to finish at the ancient monastic site at Glendalough, which was a renowned centre of pilgrimage and learning in the medieval period. Grade. Moderate grade, linear walk requiring transport at both ends. Wet underfoot conditions in places. Raingear, trekking boots and warm clothing required – take special care on public road sections. Trailhead. Take the N81 from Dublin or the R411 from Naas through Ballymore Eustace to the small Wicklow village of Hollywood. The trailhead is close by the village at 939 054. Passport Information: 083 4328442 or 087 2702099.